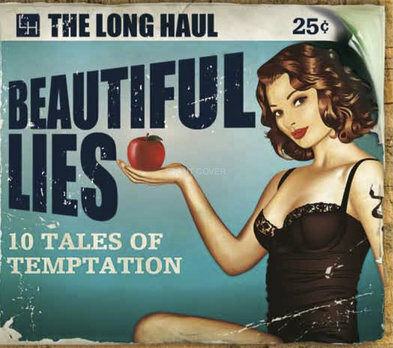 The band name implies the metaphorical distance between Brighton and Austin, but the miles are eaten away when you press play on BEAUTIFUL LIES, the new album from south coast based combo The Long Haul. There is always a danger that such a delving into the world of traditional Texas honky tonk music may end up with just a barrage of standard covers, but to the credit of this band, the new album consists of ten original compositions. The added bonus is that they all fare well when put under scrutiny and the level of authenticity gives this record acres of credibility. It has helped that the band enlisted the services of established American producer Eamon Mcloughlin to steer the project. In addition to the normal five piece band which forms the line up on home soil, the record contains esteemed playing from musicians such as Lloyd Maines and Chris Scruggs, both highly experienced practitioners of real country music. So with the help of production contributions in Nashville, Austin and Brighton, the finished product will give the band a strong selling point as they ply the live music circuit. There is a stellar retro dance hall feel to this record, whether in the foot stomping rapid numbers or those slower moments inducing more intimate movement. The sound races along to a western swing meets traditional country soundtrack, with all the usual trappings of fiddle, pedal steel, guitars and the essential rhythm combo of drums and double bass. What also helps this record succeed is a fabulous opening song. ‘Continental’ celebrates the Austin institution of the same name in a joyous manner, full of foot tapping nostalgia and an immensely catchy tune. Tunes of a similar vein are spread across this ten-track record, specifically in the songs ‘Rhythm Trail’ and ‘Existential Boogie’. Both superbly fire up a notion to visualise a scenario that for most probably only lives in the imagination. But dreaming is free and for a modest outlay this album will do its bit in fuelling them. Second track ‘Psychic Baby’ is another pick from this collection and rattles along in timely rhythm possessing fine lexicon content, especially in slotting in the splendid word ‘serendipity’. On the moments when the listeners/dancers can draw a breath, the songs ‘Blind’ and ‘Leading Light’ step in to impressive effect. ‘You're Still Here’ is another example of the record’s more poignant pieces and acts as a decent end song to close the door on an album that has successfully held your attention for just over half an hour. One observation from the title track ‘Beautiful Lies’, at the core of the record, is the Celtic feel to the strings and chorus melody, but then American roots music has it influence from right across the old world. ‘Waiting & Wishing’, heralded by some ear pleasing pedal steel, and ‘Crawl complete the album set, each playing a part in giving this record a hefty dose of merit. This latest display of Southern England meets Southern USA has captured a sweet sounding appeal and is a totally unashamed serving of replicate retro done well. There is always room for this type of music and in gift wrapping BEAUTIFUL LIES to a willing audience, The Long Haul have delivered a slice of added value to the UK’s country music community.